Florence Helen Dalby, 99, of Lincoln, passed away Friday, March 29, 2019. Born to Karl and Clara (Dohner) Stern on February 2, 1920 in Lincoln. She married Eugene Dalby March 27, 1941 in Lincoln. Florence Dalby sat courtside in her wheelchair Saturday at Pinnacle Bank Arena, eating popcorn and watching the Husker men's basketball team's 70-60 loss to Ohio State. 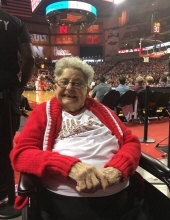 It was the closest she's ever been to the hardwood, which is saying something, because Dalby, who will celebrate her 99th birthday Friday, has been taking in Nebraska men's basketball games for the last 80 years. "It really is not all that different," she said. "It is just about like this. There is lots of cheering and lots of excitement." Eighty years. For those keeping score, that's 1939, before World War II, before rock and roll and way before anyone could even fathom something as high-tech as the internet. In terms of Husker basketball, a lot of dribbles have been taken in places such as the NU Coliseum, the Devaney Sports Center and now Pinnacle Bank Arena, which she prefers to past homes of the Huskers. "I guess I have to say Pinnacle Bank is my favorite," she said. "Devaney was very good, but they didn't have very good parking." Dalby was honored Saturday for reasons far more important than her longevity. On the day Nebraska played its Coaches vs. Cancer game that featured both coaching staffs wearing sneakers with their suits, Dalby, a 20-year cancer survivor, was among a handful of survivors honored at halftime. "It was exciting," said the former first-grade teacher at Pershing Elementary School. "That's the closest I've ever been to the action." That she's still around to tell her story is proof of her fighting spirit — and her explanation lends voice to her humility. "I had a very good surgeon," she said. "I battled it, yes, I did." Members of the Dalby family came from Las Vegas, Denver and Kansas City this weekend for Florence's 99th birthday celebration. Her two children, eight grandchildren and eight great-grandchildren were back in Lincoln for festivities that began with the basketball game. Florence is survived by her daughters; Joyce (Jim) Clair, Nancy (Steve) Hauck, grandchildren, great-grandchildren. She is preceded in death by husband; Eugene Dalby. Memorials in lieu of flowers to Vine Congregational Church children’s programs. To send flowers or a remembrance gift to the family of Florence Helen Dalby, please visit our Tribute Store. "Email Address" would like to share the life celebration of Florence Helen Dalby. Click on the "link" to go to share a favorite memory or leave a condolence message for the family.